Kitchen countertops are like shoes of your outfit – it’s the one who’s going make or break the whole. Because it’s located at the very center of the kitchen, it’s very important to make sure that it looks its best. Of course, functionality is also key in getting the right kitchen countertop for you. Mixing style with function is the right chemistry for your kitchen countertop. Below are some of the designs that you should try when building your very own kitchen countertops. Thick ledge countertops add layer and also strength to the whole look of the kitchen. Mixing it with wood accents can add a very natural yet chic feel to the whole style. Want something different and exciting for your kitchen? The lacquered copper style will transform any kitchen into a tropical dream that you won’t simply say no to. Add colors like blue and yellow to accentuate the copper’s warm feel. 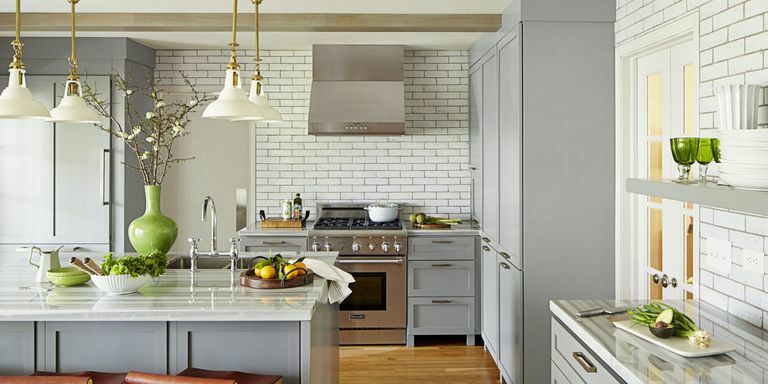 White will never go out of style when it comes to kitchen countertops. White granite will make your kitchen look like a modern Stepford wife’s dream. Add metallic accents to put a bit of masculine edge to the whole look. One of the most alternative option, oak slab is simply wood matched with other important details. It will make your feel organic and natural, making it perfect for those Instagram flat lays that we are sure you are planning. There are many reasons why wood will forever be a favorite when it comes to kitchen countertops. Wood makes any space feel homey and warm. Sealed wood will add modernity and classiness to the homey feel of the wood. It will also make your countertop resistant to heat and scratches. Metallic accents won’t go anywhere soon. They will remain classic and stylish – fitting to any kitchen that you can imagine. Brass materials will sure add a mature vibe to your kitchen – perfect for millennials who want to prove their seriousness to adulthood. Suede can add warmth to any surface. It will also make your kitchen look very clean and put together thanks to its smooth finish. Glass is perfect to any kitchen because it can make any space look better than it is. Glass tops are also the ultimate ticket in making your whole kitchen look like a modern girl’s paradise. It also looks clean at any light. Why choose when you can have everything? Mixing materials are very cost effective especially when you are going to choose expensive materials with cheaper ones. Add wood blocks with marble accents to get that modern yet still homey feel to the kitchen. Iron and metal shouldn’t be deemed as something that’s too strong for the kitchen. Iron and steel combo do sure add a serious mix to the table (literally and figuratively) but it sure does look clean and timeless in the long run. Add wooden accent if you are a bit hesitant in going all black. Marble is here to stay because it’s a very flexible material to deal with. It will also look good on any type of surface that you can imagine. Add a chevron pattern to the mix for extra depth and drama that you deserve. Invest on long lasting materials such as granite and wood for a kitchen countertop that’s definitely long lasting and worth your money. Make sure to buy materials from a good source to ensure its longevity and quality finish.